This egg recipe is easy to make which pairs best with breakfast bread or pancakes (Dosa). 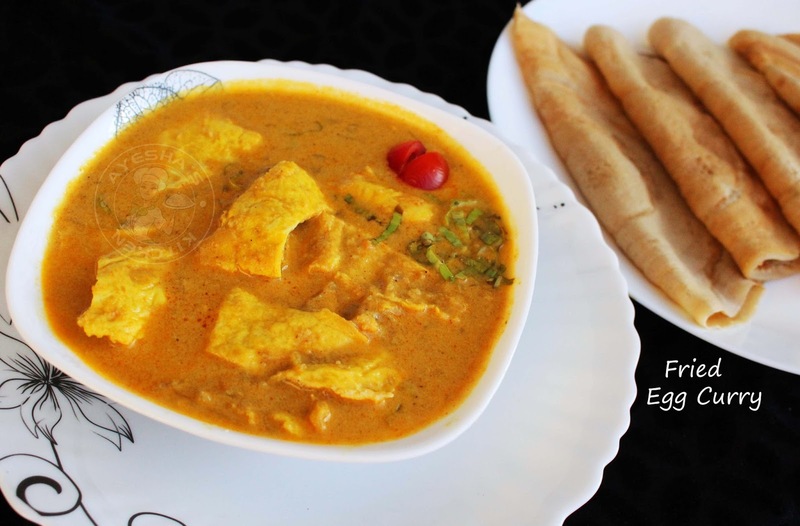 Sometimes we feel bored with having the same egg curry with hard boiled eggs and roasted eggs. 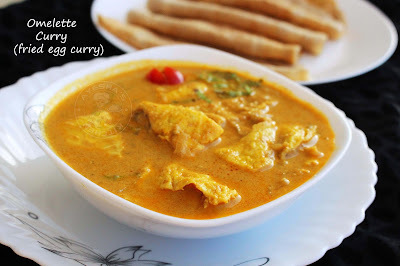 So here is a chance to shift to a new version of egg curry with fried eggs (an omelet curry). The plus point of this curry is that you can make this curry even with an egg. So you can replace the boiled eggs with an omelet whenever you don't have enough eggs for an egg curry. No need for a special introduction to an Omelette recipe, right?. A spicy omelette recipe is the only dish which is very common to most of the bachelors and starters in cooking. Hope you all try this healthy omelette curry recipe for sure. 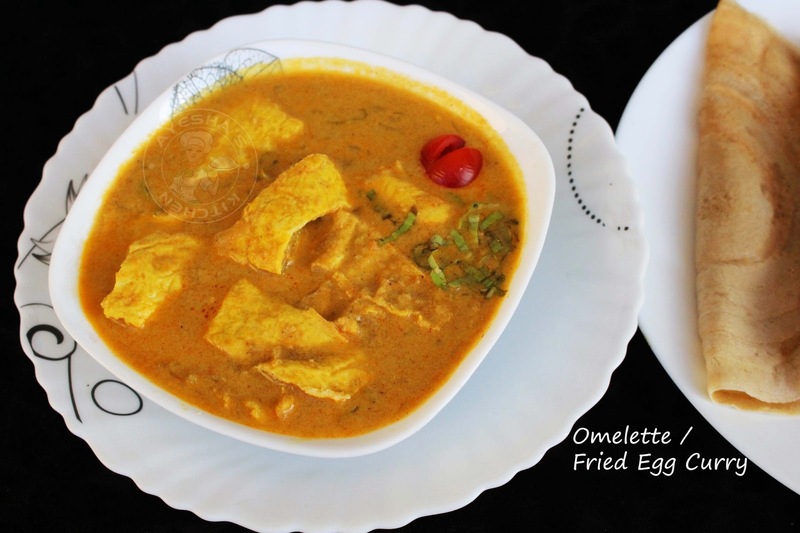 Here is the recipe showing how to make Omelette curry / omelette ideas /omelette recipe easy/egg curry recipe / curried egg recipe. Whisk the eggs well. No need of adding salt or spices because the fried eggs will absorb the spices from the curry. Heat a non-stick pan and make a minimum thick omelette. When done, cut the fried egg into 2-inch slices. Set it aside. Now heat oil in a skillet or nonstick pan. Add the chopped garlic, shallots and green chilies. Saute until raw smell goes off. To this, add the sliced tomato and let it cook until mushy. Meanwhile, grind together all the ingredients given under 'for grinding' to a fine paste. Add required water for grinding. When the tomato is done, pour this coconut mixture and combine very well. Let it boils. Check for salt. Once it is boiled, reduce the flame to medium. Allow it to cook for another few minutes to get rid of the raw smell of spices and then add the fried egg pieces (omelette slices). Mix well and let cook for 5 minutes. Heat a pan with a tablespoon of oil, fry a tablespoon of shallots chopped and curry leaves. Pour it over the curry. Serve hot along with wheat dosa, chapati, paratha, Indian bread.